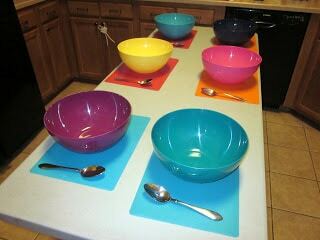 Here’s what our cooking class looked like today before the fun began…thought you might like a peek! It was my birthday during cooking class this week so I thought it was fitting that we learned how to make a Cake. 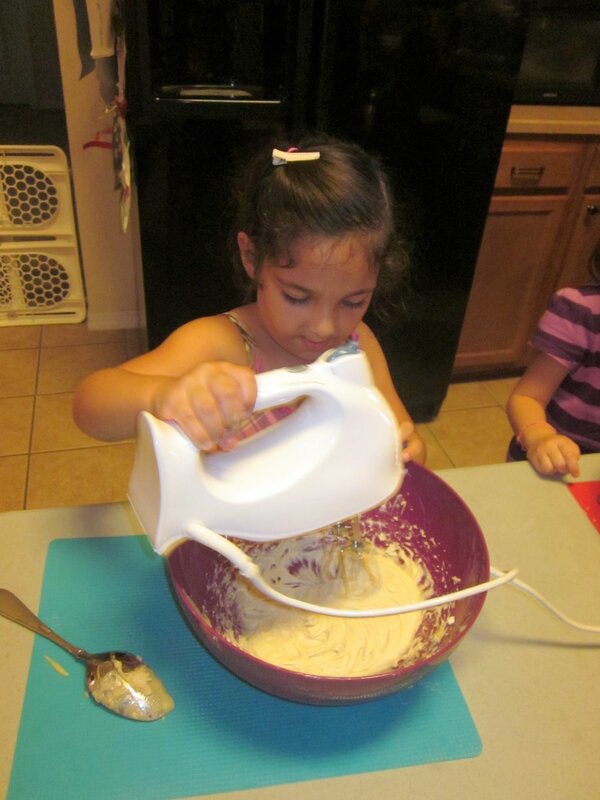 The girls were so excited to bake their very own cake in their very own bowl and baking dish. 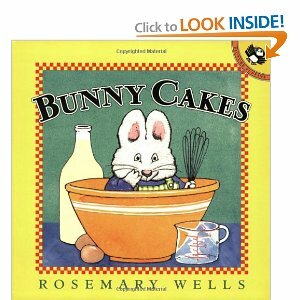 We read this adorable book about Max and Ruby making a cake called Bunny Cakes by Rosemary Wells. 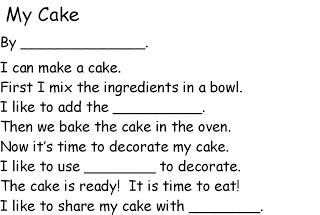 Once we got started we took a look at the recipe and noticed that there was lots of measuring involved in baking a cake. 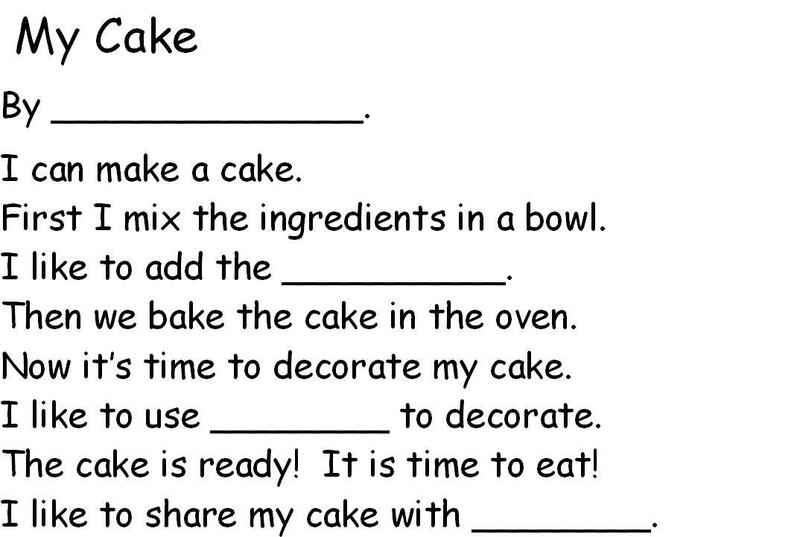 Any simple cake recipe will work for this lesson. We talked about the fractions that we saw in the recipe, something that was knew to them. I used a cupcake as an example and we broke it into half and labeled it with 1/2 on each side. Then we cut it again and labeled it 1/4 on each piece. Then we took another cupcake and cut it into three pieces and labeled it 1/3, we saved those pieces to make cake pops for tomorrow J. 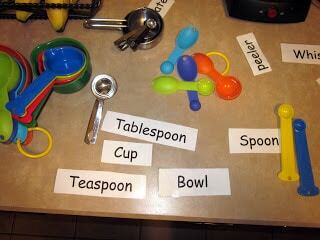 We took about the measuring cups and spoons and labeled them so we knew which ones to use. The girls were in charge of their own measuring and mixing. They even got to use the real hand mixer. We talked about how to hold the bowl with your other hand so it stays. During the recipe we had to mix quite a few things and we talked about how each was different in texture. While our cakes were baking we decorated our own cupcakes so that we could sample all our hard work. 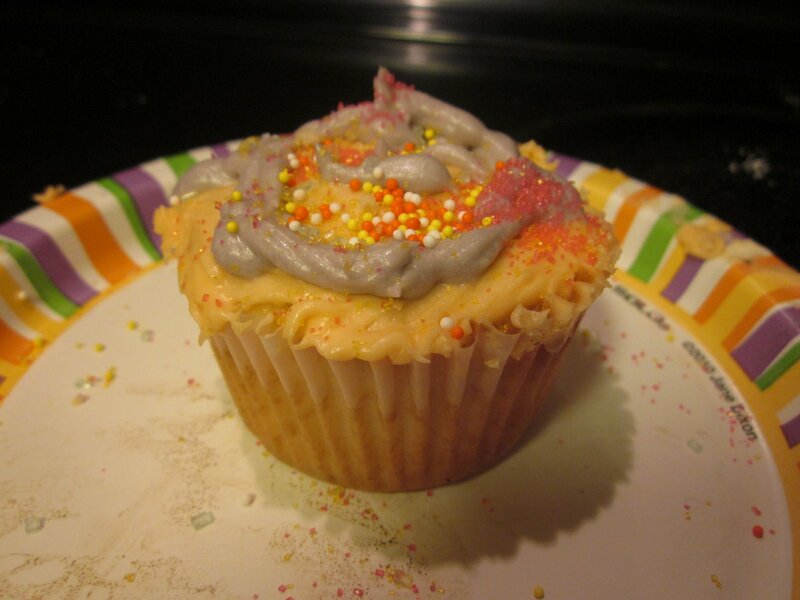 We created our own butter frosting and then decided what colors to make it. The girl’s chose orange, pink and purple so we had a quick science lesson on how to make those colors. Purple of course was the big hit. 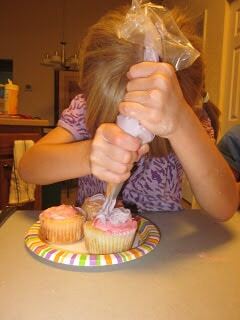 We decided to use purple frosting to learn how to pipe frosting onto our cupcakes. 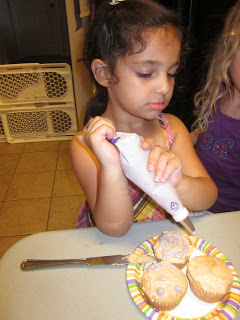 We explored how to make polka dots, flowers, and swirls. Then they had a sprinkle fest! It’s so fun to see how each child is unique in their creativity and there is no one way to do it. Once the cakes were complete the girls enjoyed decorating them to share with their family. Although a few chose to take them home to create cake pops out of then, can’t wait to how they turn out. I see a future cooking lesson in the making. 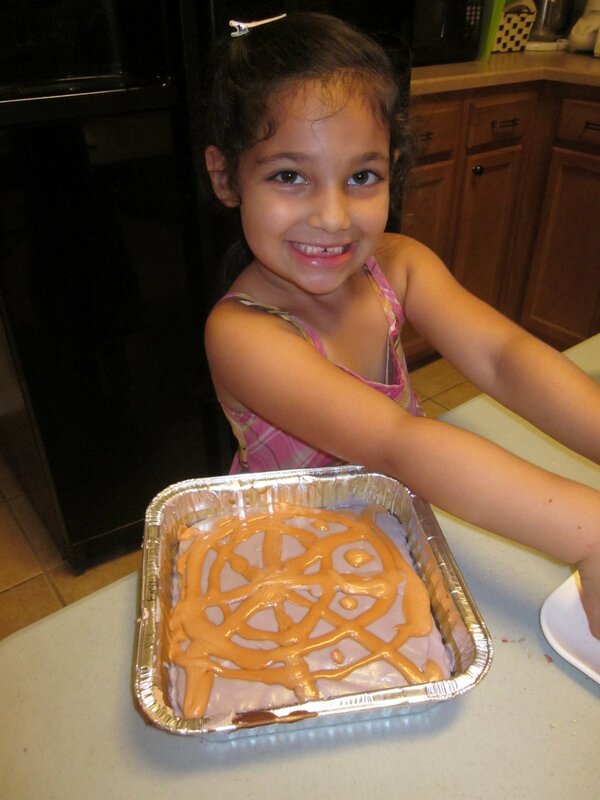 Our follow up activity was to create a book about how to bake a cake. Here’s a FREE printable for you to make at home. I cut the words into sentence strips and have the kids glue it onto the pages. That way they are working on sequences events too. Then have them illustrate the pages to match the text. Hope you enjoy baking a cake with your little ones as much as I did. What a special way to spend your birthday J A little tradition that I’ve been doing with my daughter the last few years, we bake her cake together and she gets to decorate it. She LOVES it! Just for fun! Here’s my daugther’s creating her cake for her 5th birthday. Wow! This is wonderful!! My kids love baking with me! I will have to make it into a lesson like this!! Thanks Kalista! There is so much our children can learn during cooking. I'm so glad it's inspired you to do a lesson with your little ones. You'll have to let me know how it turns out. We LOVE that book and I love the activities you did with it. The decorated cupcakes are so cute! Hope you had a Happy Birthday! Thanks ladies for the birthday wishes. Hope your little ones enjoy making the book to go along with it. Thanks Beth for asking us to join your linkey Party… love your site!!! Thanks Kristen! Would make a fun birthday party too. Hope they enjoy it as much as my daughter's friends did. That is so awesome. My son is a huge fan of that book, btw, and I know that having him make his very own cake would put him over the moon. However, he is still a bit too fond of eating the batter rather than preparing it, but now I have hope that he will one day be as adorable as your daughter! Thanks Becky. I did a lesson with the girls about once you add the eggs you can't taste it anymore. I always just let them take a taste before we add the eggs, they seem to really understand. how fun! 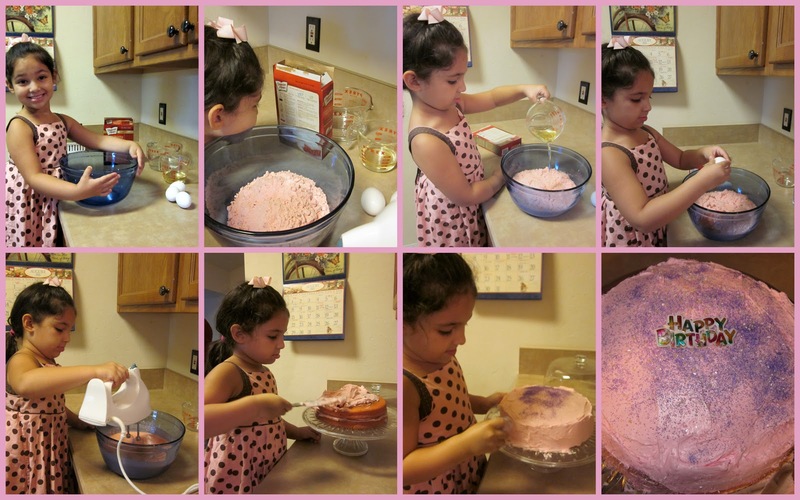 we love baking in our house & my girls adore baking cakes & cupcakes & decorating them. What a fun group! Thanks for sharing on the Sunday Showcase last week – can't wait to see what you'll share with us this week!